Kampot Pepper There are 22 products. Red Kampot Pepper is the flagship product of the PGI appellation. Each corn of Red Kampot Pepper is picked by hand. 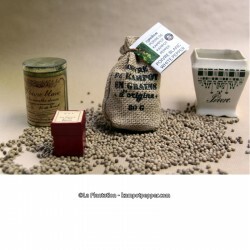 You will appreciate its incredible aroma when ground and its fruity and woody taste. Available in 100g recycle paper pack for the fans of the product. 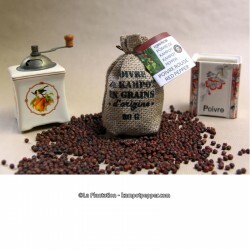 Red Kampot Pepper is the flagship product of the PGI appellation. Each corn of Red Kampot Pepper is picked by hand. You will appreciate its incredible aroma when ground and its fruity and woody taste. 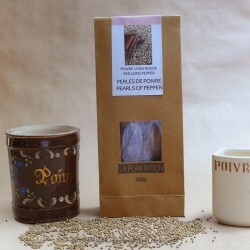 Available in jute bag containing 80g of pepper. The perfect model to offer to your friends and make them discover this wonderful product. White Kampot Pepper is one of the few peppers in the world to be produced from the full-grown red corns. Its subtle aroma and notes of citrus and eucalyptus seduce the great chefs and the amateurs. Available in 100g recycle paper pack for product lovers. White Kampot Pepper is one of the few peppers in the world to be produced from the full-grown red corns. Its subtle aroma and notes of citrus and eucalyptus seduce the great chefs and the amateurs. Available in jute bag containing 80g of pepper. The perfect model to offer to your friends and make them discover this wonderful product. 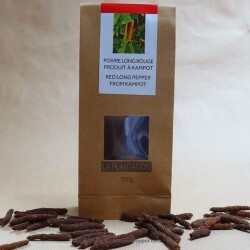 Kampot Red Long Pepper is another specie of pepper (Piper Retrofactum). Less known than Black Pepper, it is just as interesting to use in cooking or to grind on a salad, a meat or a dessert. A product to be discovered. Available in 100g recycle paper pack for lovers of the product. Recognized as one of the best peppers in the world, Kampot's Black Pepper is grown traditionally and organically. Each corn has been selected one by one by hand at La Plantation to offer you the best quality. Available in 50g recycle paper pack for pepper amateurs. Red Kampot Pepper is the flagship product of the PGI appellation. Each corn of Red Kampot Pepper is picked by hand. You will appreciate its incredible aroma when ground and its fruity and woody taste. Available in 50g recycle paper pack for the fans of the product.